The visiting Golden Eagles tallied their 9th and 10th points last night on a Michael Craig layup with 8:48 to play in the first half, which cut the fast-starting Louisville Cardinal lead to 10-19. The visiting Golden Eagles tallied their 14th and 15thh points on a Jerrold Brooks layup with 13:06 to play in the game, cutting the smothering homesteader’s lead to 15-45. Here’s the math. Five points for coach Donnie Tyndall’s visiting Southern Miss five in 15:42. They hit 28.9% from the field, 2/11 treys. They committed 22 turnovers. When they called a timeout 3:07 into the game to try to quell the Cardinal tide, U of L led 11-0 and the visitors had only taken one (1) shot. They stepped inbounds on out of bounds plays. They stepped on the sideline. They threw it away often. They were intimidated — except for one monster slam — at the rim. The word “flummoxed” comes to mind. It was Louisville’s best defensive effort of the year. Against a an average to better than average, previously unbeaten team. Which brings me to consideration of the Cards, when they had the ball. U of L was 23/55 from the field. 41.8%. They were 12/31 from beyond the arc. Here’s the math. Louisville fired seven more threeballs — 31 — than two-pointers, twenty four. The visitors played a matchup zone, which was similar to that more effectively executed by North Carolina in U of L’s only loss of the season. They did on occasion get the ball to a post player at the foul line extended, but rarely from there, except for a high/low or two, were able to get it to the rim. Or close. No back picks or slashing for an open shot from that set. The Cards moved the ball around the perimeter with more zip and purpose than against the Tar Heels. Often the ball would go to the corner, and returnto the elbow extended. The Southern Miss defenders would cheat out, meaning the guy in the corner was open. Only once that I can recall, a late assist with 5:04 on the clock from Russ to Blackshear, did the ball immediately reverse to the open guy on the wing. Those numbers and that lack of ability to effectively attack what was being given tell me the Cardinals have a long way — a long, long way — to go on O.
I nserting Mango and Terry Rozier in the starting lineup was obviously a prescient move by The Rick. Mathiang played the best, most aggressive game of his nascent career. 7 rebounds. 3 blocks, and several other hurries and misdirections. Good D at the rim. And an assist. 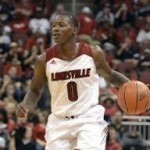 Rozier canned threes on Louisville’s first two possessions. He tallied 9 on 3/5 shooting, all beyond the arc, had three assists and a blocked shot. Perhaps the gaffe that left Luke Hancock on the bench at tip, when he was supposed to start, affected his game. He was 2/9 from the field, 1/8 from downtown. 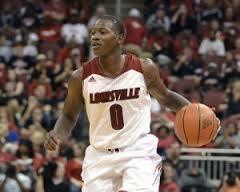 Off the bench for the first time in his career, Chris Jones led U of L’s scoring with 18. The point guard turned shooting guard was 5/10 from the field, 4/7 on longballs, 4/4 at the line. With 4 turnovers and zero assists. Russ Smith played a mature game. 11 points, all after halftime, six assists and four steals. There were a couple of possessions in the second half, when it was obvious he’d said to himself, “Okay, I need to get me some points.” As when he traveled with 3:12 to play before intermission. But, for the most part he was steady. Wayne Blackshear (9 points, 5 boards, 2 assists) and Silent L (11 points, 9 rebounds) were steady if not spectacular. Kevin Ware is playing this early season the same way he played last early season. SVT is slipping inexorably toward the far end of the bench. The Cards were a deplorable 11/22 at the line. The new intro video is sweet. Shorter, zestier and less Rick than its predecessor. As well you should have been. Some minimal research reveals William Carey is a baptist-affiliated institution of higher learning, also located in Hattiesburg, Mississippi, and features a College of Osteopathic Medicine.